Nigel Carolan is now Kieran Keane's assistant at Connacht. THEIR PATHS HAVE been varied since they played alongside each other in the early days of the professional era but Nigel Carolan is looking forward to the battle of wits with former Connacht team-mate Bernard Jackman on Friday evening. 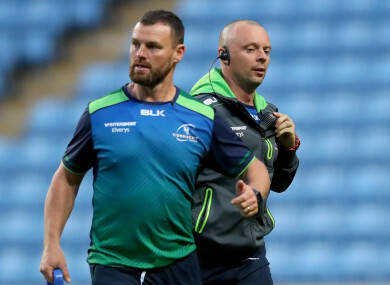 Jackman is bidding for his first win as Dragons coach while Carolan, now assistant to Kieran Keane at the Sportsground after 13 years running the Connacht academy, is hoping they can build on their 32-10 win over the Kings at the weekend. Carolan, a winger in the days in the late 1990s when Warren Gatland was trying to shape a team at the Sportsground which included Jackman in the pack, said they expect a tough encounter at Rodney Parade against a side coached by his former colleague. “He is trying to rebuild in Dragons and he is trying to create a real strong identity. They are going to be a tight-knit group much like what he did in Grenoble, they were a difficult team to play against. “He is trying to play a really expansive game and they have some real fire-power, particularly guys like Ashton Hewitt and Zane Kirchner in the outside channels. They have the old boot of Gavin Henson to rely on as well. He can kick them into positions. Glasgow last weekend it was late in the game before they pulled away. Carolan, who stepped down as Ireland U20 coach to join Keane on the Connacht coaching ticket, said that while there is ample room for improvement from the win over the Kings, having lost their opening game 18-12 at home to Glasgow, he is hopeful that the confidence gleaned from the victory will spur them on. “First and foremost, winning is important, particularly this time of the year with a new coaching team. It’s very important we get a bounce. If we can get a bounce early in the season it builds momentum. “Two years ago when we were successful that is exactly what happened during that World Cup period so if we can build upon last week it will stand to us. “But we very much picked the eyes out of it in the review on Monday, ensuring that we are not just happy because we are winning but we are improving week on week, and what are the areas where we can make the most gains. “There is still a lot of work to do and we are not going to sit back just because we got five points at the weekend. We know there is going to be a lot tougher games ahead,” added Carolan. Head coach Keane plans to tweak his side for this encounter but international scrum-half Kieran Marmion looks set to play for the third week with options limited at No.9 with new signing James Mitchell out through injury. Email “Carolan looking forward to battle of wits with former Connacht team-mate Jackman”. Feedback on “Carolan looking forward to battle of wits with former Connacht team-mate Jackman”.